PixelStick is a tool for measuring distances (in pixels), angles (in degrees) and colors (RGB) on the screen. Photoshop has distance, angle and color tools but they only work in Photoshop. PixelStick works in any app and anywhere on screen anytime and costs a hundred times less. Excellent for designers, navigators, mapmakers, biologists, astronomers, cartographers, graphic designers or anyone who uses a microscope or telescope or wants to measure a distance on their screen in any window or application. Click here to try it now free. It’s easy, simple and fast. PixelStick is a measuring tool you can pinch and stretch to measure anything on your screen. Use the eyedropper to copy colors in 4 formats (CSS, RGB, RGB hex, HTML) to the clipboard for use in any app. Cartographers – for maps or all kinds. Biologists – for microscopy and morphology. CSI Technicians – for crime scene investigations. Manufacturing – for design and fabrication. Physicists and Astronomers – for all kinds of measurements. Engineering – for mechanical, electrical and civil engineering. Builders – for measuring existing buildings or blueprints. Education – for students, teachers and researchers. Designers – for graphic, architecture, interior, space, marine, and aeronautical. Software Developers – for graphics, web, layout and user interface. Medical Technicians – for X-rays, ECG, EKG, and microscopy. 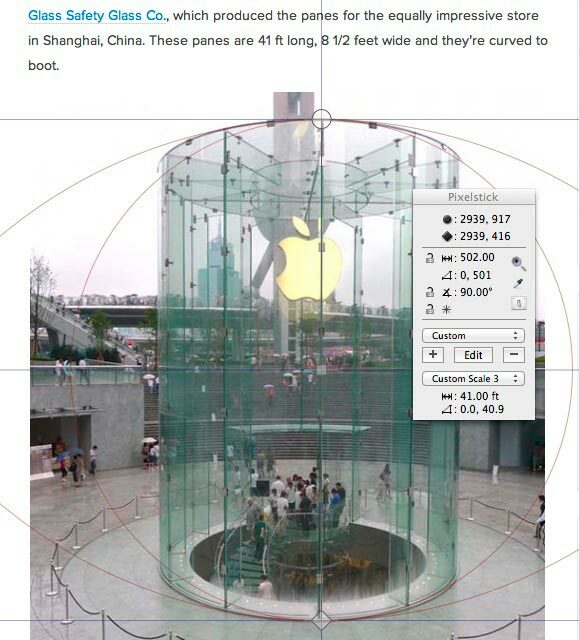 For anyone who needs to measure objects on the Mac. Retina, regular displays and multiple monitors. Any app and between apps. 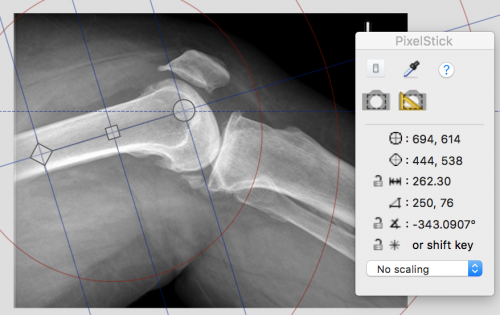 Supports the scaling in Google Maps, Yahoo Maps, and Photoshop. Also has Customized (user settable) scaling options. PixelStick is a measuring tool you can pinch and stretch to measure anything on your screen. It’s like an onscreen virtual ruler that you can use vertically, horizontally and at any angle to measure distances (pixels), angles (degrees) and much more just by dragging. When you know the scale of the document you are measuring then you can create a custom scale to measure inches, miles, centimeters, microns, parsecs or lightyears. Most of what PixelStick does is obvious. Drag the endpoints to change the measurement. Click the locks to constrain the movement. Launch it, play around, no more limitations to just one app in measuring distance, angle and color. Check out this screencast on GigaOm that shows PixelStick in use. PixelStick is totally intuitive and works exactly like what you would hope for. PixelStick sits in the frontmost position on the screen. Drag the endpoints to change the measurement. Click the locks to constrain the movement. Drag to change the angle. See the changes and info in the small on screen info panel. PixelStick uses a Cartesian coordinate system like the OS X coordinate system. This means that the origin (pixel 0,0) is at the lower left corner of the screen. However, OS X deals mainly in points, whereas PixelStick is all about pixels. A point has no width and resides between pixels. PixelStick reports both pixel distance and pixel difference. In the illustration below, the height of the picture is 13 pixels, so the distance is reported as 13.00. Note that if the diamond endpoint is at a position of y = 1, then the circle endpoint is at a position of y = 13. Thus pixel difference is 13 – 1 = 12.The pixel distance includes the width of the PixelStick endpoints. This is so that the actual size of the item being measured is reported. The pixel difference merely subtracts the coordinates. When measuring, position the endpoints inside the area to be measured.The easiest way to get both dimensions of an area is to position the endpoint exactly on top of the corner.After measuring the height (see example), the circle endpoint can be dragged over to the other corner to get the width. 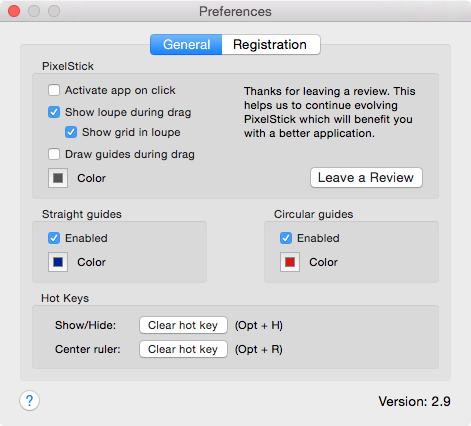 PixelStick requires Mac OS X 10.6 or later. “I’ve used a number of different screen rulers over the years, including Free Ruler and the rulers in Art Directors Toolkit. But nothing comes close to PixelStick. PixelStick is different. There are no rulers to block your view of the screen. Instead, PixelStick displays a measuring line. Drag the endpoints to measure the distance. To measure height and width, position the endpoints on the corners, then drag one endpoint to the opposite corner to measure the other dimension. You can lock the endpoints to constrain the length or angle, or to snap the line to the nearest 45° angle. PixelStick also displays guidelines to help you quickly measure or align objects at a glance. * Designers – for graphic, architecture, interior, space, marine, and aeronautical. * Software Developers – for graphics, layout and user interface. * Cartographers – for maps or all kinds. * Medical Technicians – for X-rays, ECG, EKG, and microscopy. * Biologists – for microscopy and morphology. * CSI Technicians – for crime scene investigations. * Manufacturing – for design and fabrication. * Physicists and Astronomers – for all kinds of measurements. * Engineering – for mechanical, electrical and civil engineering. * Builders – for measuring existing buildings or blueprints. * Education – for students, teachers and researchers. 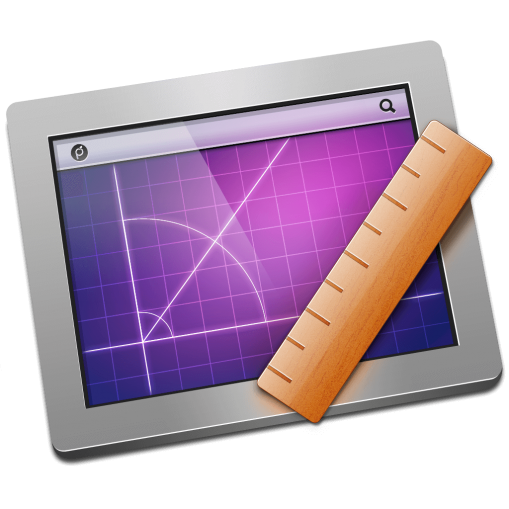 …anyone who needs to measure objects on the Mac. Anyone can use PixelStick because it’s easy to use, simple and fast. It’s like an onscreen virtual ruler that you can use vertically, horizontally and at any angle to measure distances, angles and much more just by dragging. Using the palette one can lock distances and angles (also by using the shift key). IMPORTANT: With PixelStick 2.12 now recommends that its default scale uses the coordinates directly reported by macOS. Previously it scaled those coordinates by a screen-dependent "backing scale" (typically 2x for Retina screens). that scaling until you open PixelStick's preferences and select "Use macOS coordinates". [New] Reworked the loupe code so that the magnified screen images are much crisper and do not include magnified copies of PixelStick's endpoints and guides. [Fix] Prevent the situation on some systems where the cursor appeared in the endpoint and colour picker loupes (and thus was magnified and prevented colour selection). [Fix] Remove the red frame from accessibility element screen grabs. [Fix] Corrected the measurements PixelStick reports when moving PixelStick from a Retina screen to a non-Retina screen. [Fix] Redraw and, if necessary, adjust PixelStick's endpoints when the display's scale is changed via Displays Preferences. [Fix] Reduce duplication of some internal calculations, improving consistency between unscaled and scaled measurements. [Fix] Draw circle guides correctly on Retina screens. [Fix] Improve behaviour when editing values directly in the palette. [Fix] Double-click on the palette title bar only to collapse the palette. This means double click within the content of the palette now correctly selects the text to edit instead of collapsing the window. IMPORTANT: If you have version 2.5 then you need to manually download and replace the old version with the new version on our site. [new] Remembers the last used scale and eye dropper settings. [new] Can now measure angles relative to a non-horizontal baseline. [mod] Angle and length now displayed with more precision (i.e. not rounded to integer values). [new] User preference setting for displaying or hiding the loupe shown when dragging points. [new] User preference setting for displaying or hiding the grid inside the loupe (when the loupe is shown). [fix] Loupe view now also works on OS X 10.6 (previously it only could appear on OS X 10.7 or higher). [fix] Make closing the preferences window behave in a more standard fashion. [fix] Restore the missing app icon and include hi-res versions. [new] Support for the "Screens have separate Spaces" user preference added in OS X Mavericks. [fixed] Color picker shows the wrong color in some screen arrangements, particularly when secondary screens are arranged higher or lower than the primary screen. [fixed] Loupe not magnifying the correct area of the screen on secondary screens in some screen arrangements. [fixed] Reset position can result in endpoints moving off-screen some screen arrangements. [fixed] PixelStick does not extend into newly revealed screen space when screen arrangements are changed while PixelStick is running. [fixed] Crashes on OS X Mavericks and higher when selecting the "screen elements" ruler more than once. [new] this version courtesy of guest programmer Bernie Maier of australia. thanks should be directed to him for this holiday gift. Bernie identified issues with multiscreen support and stepped and nailed them and made other improvements. Big thanks to him for his ability to quickly get up to speed, understand and make a huge contribution to PixelStick. [mod] updated graphics, icons and function for retina displays (thanks to user Damien). [fix] cursors disappearing under "invisible rug". this happens when you use several displays or simply change screen resolution (thanks to user Colin Murray's). [fix] position of main panel was not saved in older versions of OS X (thanks to user Chris Pritchard). [mod] optimized code and compiled with xcode 4.4. [new] signed by plum amazing with apple developer certificate to follow apple's latest security guidelines. [mod] rewrote the code dealing with resize panel 100% lion (Mac OS 10.7) compatible. [mod] 100% lion (Mac OS 10.7) compatible. [new] eyedropper copies the color under the cursor using copy (command c) in the chosen format. [new] zoomed view shown under the cursor. [new] user interface changes and additions. [mod] code updated, optimized and improved. [new] customized scaling settings in addition to templates for google and yahoo maps and in photoshop. [Fix] added copy and paste to the registration dialog. PixelStick is a tool for measuring distances (in pixels), angles (in degrees) and colors (RGB) on the screen. Photoshop has distance, angle and color tools but they only work in Photoshop. PixelStick works in any app, between app, in the Apple Finder in addition it is lightweight, handy, fast and inexpensive. Excellent for designers, navigators, mapmakers, biologists, astronomers, cartographers, graphic designers or anyone who uses a microscope or telescope or wants to measure a distance on their screen in any window or application. 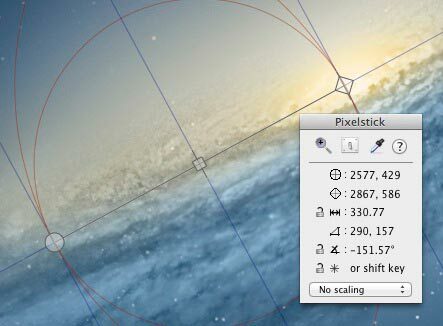 PixelStick is a sophisticated ruler, protractor and eyedropper that works anywhere that you do on your Mac. 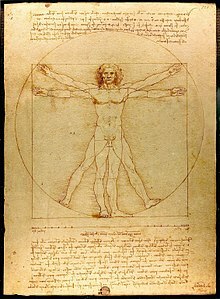 Measurement can be defined as ..
.. a known, pre-selected value of the same physical quality/dimension/phenomena, called the Unit.. ..So that we can find out how many iteration or fractions of the unit..
..are contained in the unknown quantity. … So that we can find out how many repeations of the unit equals the unknown quantity. Accurate measurement is essential in many fields, and all measurements are necessarily approximations. PixelStick measures pixels and the distance between pixels. The relation between pixels and whatever you are measuring is scale. It is measurement by comparison. In this way PixelStick can measure distance between galaxies planets, countries, cities, people, molecules, atoms or various sub-atomic particles in a photo if the scale is known. It is the same as the use of scale in a map. In a map you can look at the bottom right and see the scale which might be 1 in/1 mile. On that map cities that are 5″ apart are 5 miles from one to the other. Custom scales are available are available in PixelStick and can be used by astronomers, microbiologists, etc. PixelStick is a utility that allows easily measuring distances and angles on your screen, zooming in under the cursor to show colors and allows copying those colors in 7 formats (CSS, HTML and several RGB integer and hex variations) in any application, window and across the desktop. In addition it does scaling so if you know the scale of a document you can measure its contents. Out of the box its measurements will work with Google Maps, Yahoo Maps and Photoshop. Since there is no standardized scale for arbitrary documents on the Mac, for other documents you can create customized scaling options in PixelStick that it can use in its measurements. Most of what PixelStick does is obvious. Drag the endpoints to change the distance or angle. Click the locks or hold down the shift key to constrain the distance or angles. How PixelStick behaves when you have more than one screen depends on your version of macOS/OS X. OS X Mavericks introduced a user preference to allow screens to have separate spaces. When this preference is set (it set on by default in OS X Yosemite), application windows cannot span multiple screens. Therefore, PixelStick can only measure on one screen at a time when this preference is set. You can switch which screen PixelStick is measuring on by dragging the midpoint (i.e. the square) between screens. You can also use the Reset Position menu item on the copy of the menu on screen you want to measure on; if the PixelStick menu is not visible on that screen you can just drag the palette to that screen. When the screens have separate spaces preference is not set, or when PixelStick is running on older versions of macOS, PixelStick spans all available screens. PixelStick requires Mac OS X 10.7 or later. Older versions of PixelStick are available for older versions of Mac OS. 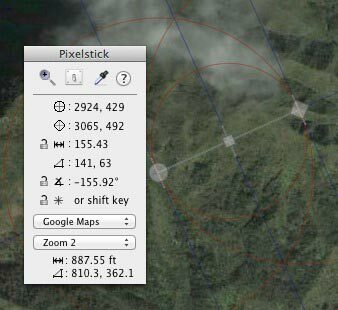 PixelStick uses a coordinate system like the macOS coordinate system. X can be seen as width and y as height. This means that the origin (pixel 0,0) is at the lower left corner of the screen. However, macOS deals mainly in points, whereas PixelStick is all about pixels since pixels are easier to visualise when describing a document on a screen. A point has no width and resides between pixels. Note that on modern hardware and modern macOS versions, these pixels are not necessarily the physical pixels on a display, especially a Retina display. macOS has scaling options that take away the direct correspondence between hardware pixels and what it reports to apps (like PixelStick) as pixels. PixelStick reports both pixel distance and pixel difference. When you see two numbers together in the user interface of PixelStick like this 230,114 it is (x, y) or (width, height). x starts at the bottom left of the screen. The pixel distance includes the width of the PixelStick endpoints. This is so that the actual size of the item being measured is reported. The pixel difference merely subtracts the coordinates. In the illustration to the right, the height of the picture is 13 pixels, so the distance is reported as 13.00. Note that if the diamond endpoint is at a position of y = 1, then the circle endpoint is at a position of y = 13. 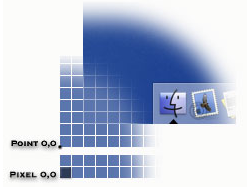 Thus pixel difference is 13 – 1 = 12. By default, PixelStick reports the angle between the baseline (usually the horizontal line but if you set a new baseline, this is the dotted line) and the line made by the endpoints with values increasing as you move the diamond endpoint anticlockwise. The angle values can be positive or negative depending on the position of the diamond endpoint relative to the circle endpoint. If you turn on Map Mode PixelStick changes the way it reports angles to be like bearings on a map. It reports angles using only positive values from 0 to 360 degrees, increasing clockwise. The baseline still defaults to horizontal or whatever you set it to last time. To set the baseline as north / south, just shift+drag the diamond endpoint to be above the circle endpoint and set the baseline, which is now a vertical line. Preferences – open and close the PixelStick prefs. Eyedropper – expands the palette to reveal the loupe and eyedropper tools. Help – opens this online manual. Screenshot – The screen grab icon displays a window with a preview of the current contents of all screens. You can then click and drag to select the region of the screen to grab. PixelStick then prompts you for a location to save the image file containing the screen grab. IMPORTANT: try this handy one! Screen elements – The screen elements ruler icon allows you to measure elements that make up the windows of the currently running applications. To do this, you must give PixelStick permission to access macOS’s accessibility services. When you click on the icon the system will put up this dialog. 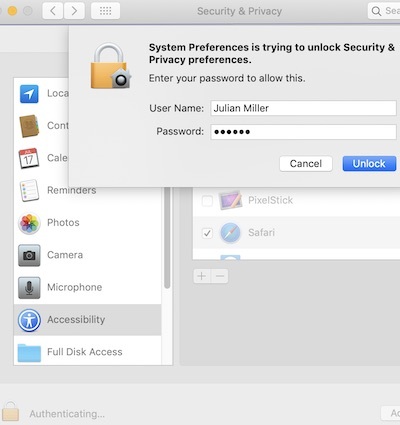 Tap the ‘Open System Preferences’ and it will open the System Preferences:Security&Privacy:Privacy:Accessibility settings and will add PixelStick to the list on the right. Unlock that dialog (at bottom left) and make sure to add a checkmark to the left of the PixelStick icon. Now PixelStick has permissions. Once you have granted permission to use the accessibility services, the next time you click on the screen elements ruler icon various screen elements underneath the mouse cursor will be highlighted and PixelStick shows the dimensions of the highlighted element. Circle endpoint – draggable point of measuring. Shows x and y.
Diamond endpoint – draggable point of measuring. Shows x and y. Distance – pixel distance in pixels based on the circle and square endpoints. Distance – locks the distance when rotating or adjusting the ruler. Delta – pixel difference between the circle/square endpoints in x and y values. Angle – unlocked freely change the angle. Locked Angle – click to lock maintains the same angle when adjusting the ruler. Locked Snap – click to lock or hold shift key so rotation snaps to 45° increments. Unlock – Click the lock to lock/unlock. TIP : Double click any measurement to select it and then copy to the clipboard. The PixelStick palette (seen above) displays your measurements. The drop down menu (at the bottom of the palette above) displays ‘No scaling’ clicking it reveals the items to the right. Selecting Google Maps will allow you to scale the measurement for a particular zoom on google maps. Q: Can i measure in millimeters? A: PixelStick measures in pixels but it could measure anything but to do that it requires a scale. If I gave you a map with no scale, would you be able to tell me the real-world distance between two points? No. PixelStick can work and give you distances in maps when it knows the scale. The same is true for inches, miles or AU. 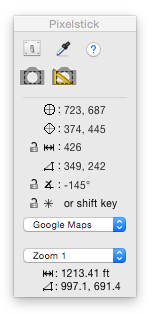 This can be in the seen in the scaling dropdown menu of PixelStick which shows, Custom, Google Maps, Yahoo Maps and Photoshop. These we added and you can use custom to add your own scales. Q: I’m an astronomer. How do I create a custom unit like AU for PixelStick and make 1 AU to be x pixels? A: PixelStick has two ways to set scaling to custom units like AU. If you know how many pixels make up 1 AU, you can set the zoom factor directly. The zoom factor is the reciprocal of the distance in pixels. For example, if 1 AU is 100 pixels, the zoom factor is 1/100, i.e. .01. Select custom scaling and click on the Edit button or + button to add a new scale. In the Zoom field, enter 0.01. Click OK. Now, when you measure with PixelStick, the distance in your custom units is shown at the bottom of the panel in addition to the distance in pixels shown in the middle of the panel. The other way is if you don’t know the exact scale, but you have a reference image where you can measure a known distance. You first use PixelStick to measure out on the screen a length of (say) 1 AU. Then select custom scaling and click on the Edit button or + button to add a new scale. In the Distance field, enter 1. Click OK. Now PixelStick will show the distance in your custom units is shown at the bottom of the panel as in the first example. Q: When I set the Zoom or Distance field why do the other field changes automatically? A: This is because of the two different ways you can specify a custom scale. Also, some users may just want a known zoom factor rather than alternative units, and so PixelStick allows the custom units to be set by either entering a zoom factor or by measuring a known length and entering that length. The eyedropper icon leads you to the screen seen below. The point of the cursor is over a pixel and that area is magnified and the color is displayed. Below that you can choose from the drop down the color format to get that particular color number at the bottom. Once the cursor point is over the color you want to capture select the text displayed in the palette and press Command+C to copy the number to the clipboard. Preferences – See below for details. Check for Updates – If you have the shareware version from us you can click this to check for new version. Getting fresh new versions right away is one very good reason to get your software direct from us. Invert Colors – Inverts the colors. Reset Position – If for some reason changing monitors puts the ruler out of your reach click this and it will center it on the screen. Set Baseline – Sets the line between the two endpoints as the baseline against which angles are measured. This allows you to measure arbitrary angles, not just angles relative to the horizontal. PixelStick draws this baseline as a dotted line. Map Mode – Changes the way angles are displayed in the palette: either increasing anticlockwise like on a regular geometric plane or (when map mode is on) increasing clockwise like bearings on a map. Help – One way to get to this manual. Activate app on click – Checking this means you can click on the ruler to bring the whole PixelStick app to the front. It is off by default because you can have the app running and use the ruler to measure things in PhotoShop without pushing PhotoShop into the background. Show loupe during drag – Check this option to be able to see the loupe that magnifies the area under the endpoint you are dragging. 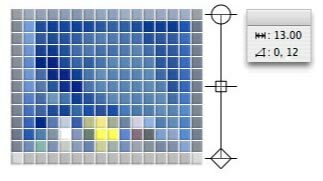 Show grid in loupe – Check this option to add a grid to the loupe to help identify how the underlying pixels are magnified. Draw guides during drag – Check this option to be able to see the guide lines when you are dragging the ruler around. There are also options to choose the color of PixelStick’s endpoints plus the straight and circular guide lines and whether or not to display the guides. In general changes take effect immediately, so you can try turning on/off and changing settings then try the ruler out to see how the preferences affect the way it works. When measuring, position the endpoints inside the area to be measured. The easiest way to get both dimensions of an area is to position the endpoint exactly on top of the corner. 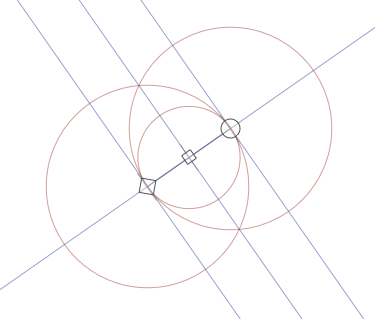 After measuring the height (see example), the circle endpoint can be dragged over to the other corner to get the width. 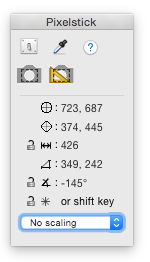 In the Pixelstick preferences set hotkeys for Show/Hide and to Center Ruler. Minimize Palette – double click title bar also hides guidelines. Show/Hide Palette – hit the hotkey set in the preferences also hides guidelines. Angle Lock – hold the shift key and it will lock every 45, 90 and 180 degree angles. Invert Colors – control key and click to show the contextual menu. * All of the below work when the Pixelstick app is the frontmost app. Right, Left and Up, or Down Arrow Keys – moves the whole ruler 1 pixel in that direction. Right, Left and Up, or Down Arrow Keys + Shift Key – moves the whole ruler 10 pixel in that direction. Command + Left or Right Arrow Key – to have the square move 1 pixel away from the circle, so the ruler expands in size. Command + Left or Right Arrow + Shift Key – to have the square move 10 pixel away from the circle., so the ruler expands in size. Command + Up or Down Arrow Key – to have the diamond rotate around the circle. Command + Up or Down Arrow + Option Key – changes the angle, circle is the center and square is the part that moves 1 degree. Command + Up or Down Arrow + Option + Shift Key – changes the angle., circle is the center and square is the part that moves 10 degree. Q: When I move the handles while holding down the shift key (so that the two handles are constrained to a horizontal line), I get two different numbers for the total-distance and component-distance. An example would be in the screenshot provided. The distance shows 180.00, and the components read 179 and 0. Which is the right distance, and why is it different? A: The answer is here under Distance. Q: I am an orthopaedic surgeon and would like to measure the angle between the femur above and the tibia below. This is called the angle of knee flexion. How I can measure that angle with this software. Can you detail the steps? 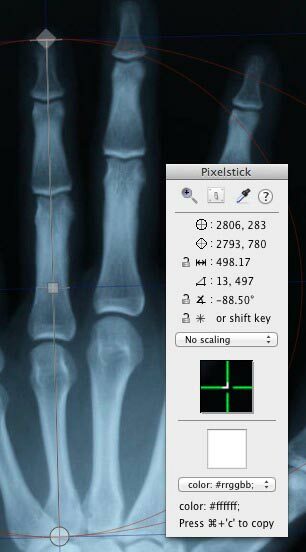 A: Pull up a photo of the item (femur, knee and tibia in this case) you want to measure the angle of and place the circle endcap of the pixelstick ruler on the knee, like the screenshot below. The circle is on the knee and the square on the femur and the angle reads -343.0907. Swing the square endcap to the tibia. Below you see the angle is 137.2244 degrees. It may be useful to use the hotkeys (above) to set the angle from the keyboard. Q: Where are the preference files located? Please purchase PixelStick to remove all limitations and the dialog that comes up after 30 days, and to support the continuing evolution of PixelStick. We appreciate suggestions and bug reports. Please write to us. PixelStick Use In Navigation and Cartography. PixelStick Use In Meteorology, Climatology and Atmospheric Physics.